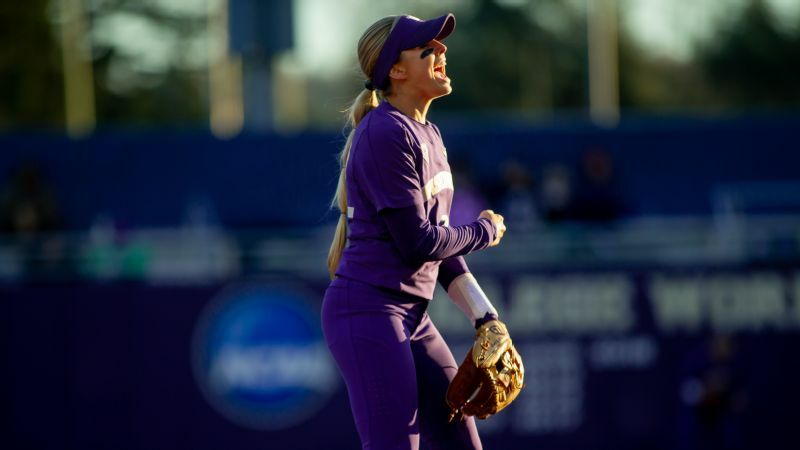 No matter the stakes, Sis Bates exudes joy in the Huskies' infield. The best-known glove in softball resides in semi-retirement in Sis Bates' locker at the University of Washington. 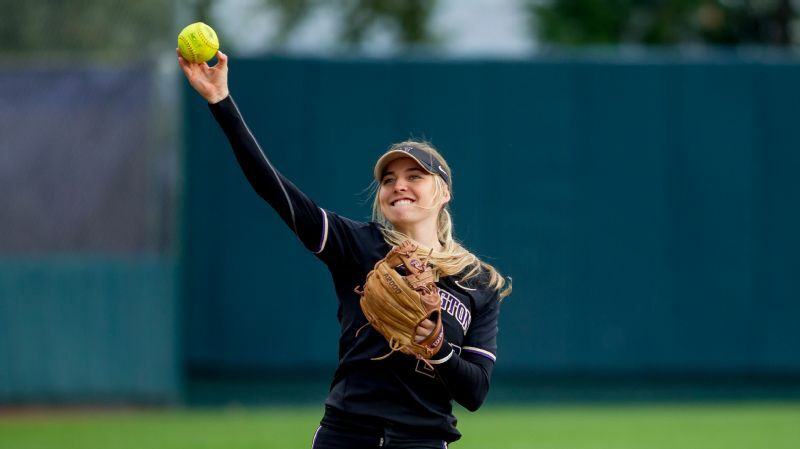 Life is cushy these days for Carmella, the name Bates bestowed on a mitt otherwise known as the Wilson model A2000 that she used through her first two seasons with the Huskies. Though Carmella is no longer subject to encounters with the infield dirt, Bates still dotes on the glove, oils it daily and boasts like a proud parent that it is "looking beautiful as ever." The care is partly to keep the mitt ready in an emergency, lest something happen to her new glove that is still awaiting a name. But it's also partly because Bates, who even as a kid would gently place her glove down at the end of innings instead of flinging it away, is just a little bit different. Arthur has Excalibur. Harry Potter has the Elder Wand. Bates has her glove. "The true ballers, if you will, they have those relationships with their equipment," Washington coach Heather Tarr said. "I've been lucky enough to watch the Japanese team play for the last two years [coaching with USA Softball]. You look at them and their glove is never out of shape. It's never not polished up. It's never not taken care of. "Sis takes care of her glove to that level." 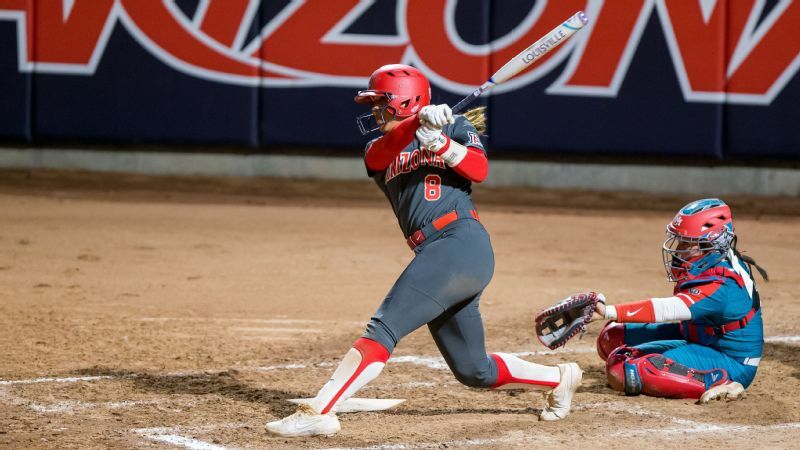 It is a shame that Carmella can't write a memoir and share stories of Bates winning Pac-12 Defensive Player of the Year honors a season ago as a sophomore, playing for the national team last summer and generally creating more breathtaking highlights than any infielder in a generation. It's a shame because there is no better way to understand the player than through her glove. One of the sport's most appealing players, who leads Washington into Oregon this weekend in a series that opens Saturday on ESPN at 4 p.m. ET, is a combination of childlike joy and virtuoso attention to detail. What is unmistakable about Bates is that she is exactly the person you expect would name a glove. Plenty of infielders exude energy. They bounce up and down between pitches, call out encouragement and perhaps even shimmy to music played between innings. For lack of a more sophisticated measurement, it's the laughter that separates Bates. Whether it's a midweek game of little consequence or the Women's College World Series, Bates is more likely to dissolve into laughter at the end of a play than pump a fist. A poker face is out of the question entirely. "Bates is just a whole other level. I think people, they enjoy watching her. She's a performer." Sis Bates has parted ways with "Carmella," but the Washington junior continues to make sensational plays at shortstop. She is comfortable in a crowd, to be sure. The middle of three siblings -- her older brother, Jimmy, is in his first year as a graduate assistant for the Huskies -- she likes being among people. She lives with a few teammates and likes when even more stop by for breakfast. "I'm just so grateful that our coaching staff lets us give our personality while we're on the field," Bates said. "I'm pretty crazy all the time with my teammates. I think that's because they're like my sisters and I'm comfortable with them. I am pretty outgoing everywhere else, but softball is like my home and I feel like that's where you see my full personality." Who's the best NCAA softball shortstop of the past decade? What that personality at times obscures is the discipline and drive that go into perfecting the glove work responsible for so many of those grins. Bates plays like she breezes through life, yet she's the same person who made the junior national team in 2017 after she initially wasn't invited to try out. Then she did it again with the senior national team, playing for Team USA in 2018 after going through an open tryout process when she wasn't invited to the main selection trials. Heck, she wasn't even fawned over by her future college coach in the recruiting process. Tarr didn't know who Bates was when she showed up to a youth tournament, only learning through a mutual acquaintance that the tiny shortstop whose lateral movement caught her eye was a huge Washington fan because of the team that won the national championship in 2009. She could play with a chip on her shoulder. Instead, you half expect to find songbirds perched there. But again and again, even if motivated by the sheer joy she finds in the game rather than a need to prove anyone wrong, she put in the work to hone natural gifts into polished excellence. "She converts most of the balls she can get to into outs; that's as good as having a dominant pitcher," Tarr said. "When she graduates, it's going to be like you graduate a pitcher who has a sub-1.00 ERA, in a way. The ball is always converted into an out. If it's possible, it's going to be converted into an out, whether it's routine or not a routine play. She's super efficient." Go back to the glove. If naming a glove and treating it as one would a child is proof of a playful quirkiness, her care for it and attention to its nuances also prove her seriousness. Consider the way she wears it. 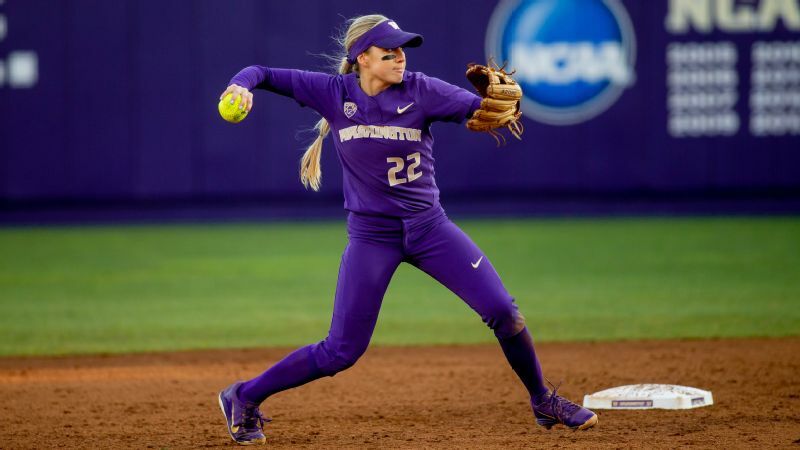 When Bates arrived at Washington, third baseman Taylor Van Zee mentioned she had started to place both her pinky and ring finger in the glove's pinky slot to good effect. As Tarr explained, this can help a player with smaller hands maintain the all-important open pocket -- two weaker fingers working in concert to offset the natural dominance of the thumb side of the hand. "I tried it, and I never looked back," Bates said of breaking in Carmella as a freshman. "I think that, backhands especially, you have more squeeze with two in the pinky." Flashy and steady, Sis Bates is the reigning Pac-12 Defensive Player of the Year. She will keep taking the extra ground balls, before practice with assistant J.T. D'Amico or after with her brother, to be able make the plays that amaze fans. She will keep laughing when she does -- and in those rare instances in which she doesn't. But the next challenge for Bates, whose hopes of making the national team that will compete this summer ended when she injured a hamstring and quadriceps during tryouts in January, is growing beyond the comfort of being part of an ensemble at Washington. Her talent begs her to be a conductor. No glove can help her there. "You hope that as she matures within a team environment, her voice becomes more important," Tarr said. "Her ability to tell the truth to people around her, versus just try to get along with people around her, is what her biggest influence is going to be over the next 16 months within our program specifically. Because that's really what true elite leadership is, is not only being able to perform to your own best abilities but also influencing others around you." Just don't expect a Danielle Lawrie death stare to replace the grin. 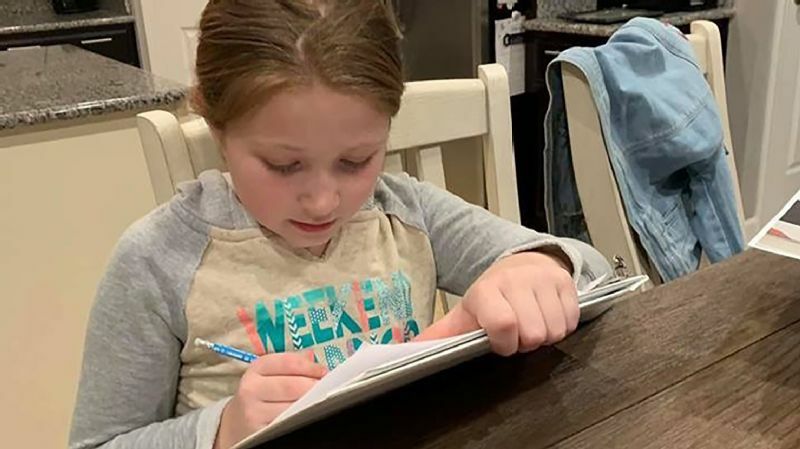 There is a reason, after all, that Lawrie, Washington's all-time greatest player and part of the Canadian team that hopes to qualify for the 2020 Olympics, isn't even her oldest daughter's favorite player. That distinction belongs to Bates, both because she is the kind of person who keeps a glove named Carmella in her locker and because she does things with it that can make anyone grin like a kid. "I don't think I've ever met anybody who is like her in that way, from the energy that she brings," Tarr said. "It's definitely not fake, and it's not over the top. I think the fact that it is what it is makes her who she is -- not over the top, just authentic and real."